Dental caries, also known as tooth decay or a cavity, is a disease where bacterial processes change carbohydrate like sugar in food left on teeth to acid that demineralises hard tooth structure (enamel,dentin, and cementum). If demineralisation exceeds saliva and other remineralisation like from fluoride, these tissues progressively break down, producing dental caries (cavities, holes in the teeth). Two groups of bacteria are responsible for initiating caries: Streptococcus mutans and Lactobacillus. If left untreated, the disease can lead to pain, tooth loss, infection, and, in severe cases, death. 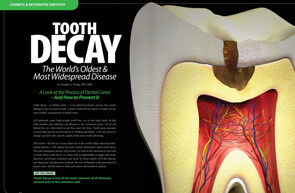 Today, caries remains one of the most common diseases throughout the world. Cariology is the study of dental caries. The presentation of caries is highly variable; however, the risk factors and stages of development are similar. Initially, it may appear as a small chalky area that may eventually develop into a large cavitation. Sometimes caries may be directly visible, however other methods of detection such as radiographs are used for less visible areas of teeth and to judge the extent of destruction. Lasers for detecting caries allow detection without radiation and now are being used for detection of interproximal decay (between the teeth). 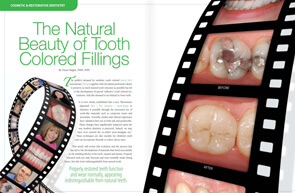 Disclosing solutions are also available that are used during tooth restoration to minimize the chance of the recurrence. 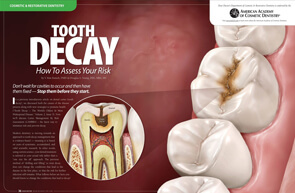 Tooth decay is caused by specific types of acid-producing bacteria that cause damage in the presence of fermentable carbohydrates such as sucrose, fructose, and glucose. The mineral content of teeth is sensitive to increases in acidity from the production of lactic acid. Specifically, a tooth (which is primarily mineral in content) is in a constant state of back-and-forth demineralization andremineralization between the tooth and surrounding saliva. For people who have little saliva, there also exists remineralization gel, especially due to radiation therapies which may destroy the salivary glands. These patients are particularly susceptible to dental caries. When the pH at the surface of the tooth drops below 5.5, demineralization proceeds faster than remineralization (meaning that there is a net loss of mineral structure on the tooth's surface). Most foods are in this acidic range and without remineralization, this results in the ensuing decay. Depending on the extent of tooth destruction, various treatments can be used to restore teeth to proper form, function, and aesthetics, but there is no known method to regenerate large amounts of tooth structure, though stem cell related research suggests one possibility. Instead, dental health organizations advocate preventive and prophylactic measures, such as regular oral hygiene and dietary modifications, to avoid dental caries.